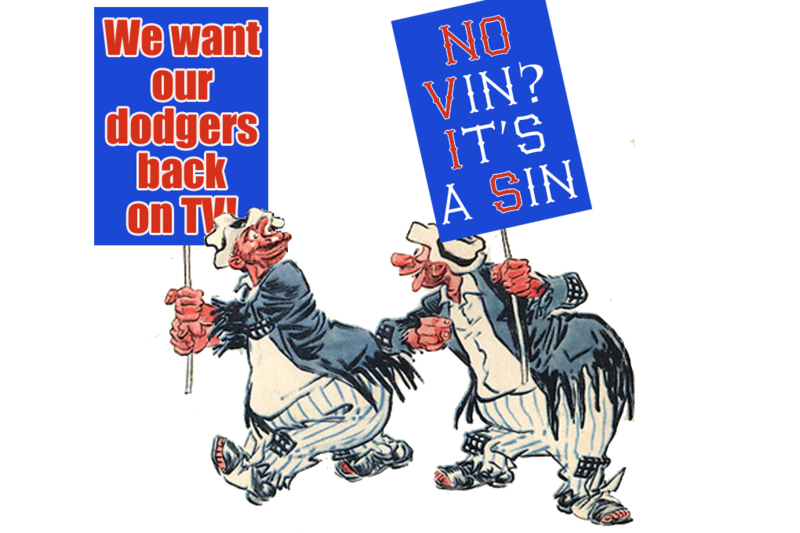 I don’t know about you guys, but I’m sick and tired of not seeing the Dodgers on TV. 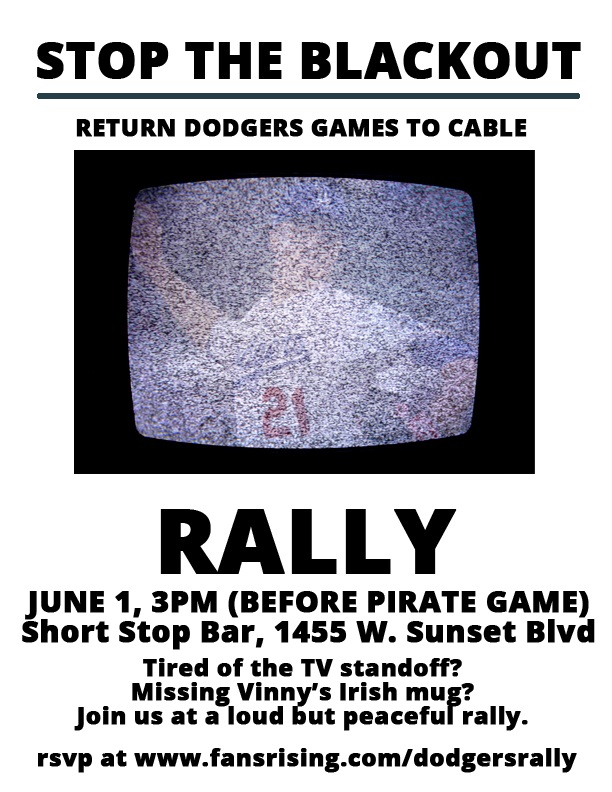 I will be joining other Dodger fans at a peaceful but noisy rally to raise a stink about Dodger management’s apparent lack of interest in us. This should NOT be happening. Kershaw was awesome yesterday as the Dodgers shut out the Phillies, 2-0, but only a few of us got to see it, and I wasn’t one of them. The greed and insensitivity of $tan Ka$ten, Mark Walter, Magic Johnson, Peter Guber and Guggenheim Partners for signing this obviously bad deal (for us) with Time Warner Cable boggles the mind. They are talking right out of their asses when they say they have the fans’ best interests at heart. A few statues of World Series rings and a scary bobblehead mascot do not come close to making up for losing the ability for regular folks to watch the games on TV. The Dodgers, “Dem Bums,” the people’s team — working class underdogs who occasionally make magic happen. I know they are all millionaires now, but that’s not the point. They stand for the regular guy, and that’s why I love them and have loved them since I was a kid. This management team is the antithesis of that. They want one thing and one thing only: cold, hard cash. The colder the harder the better. To match their hearts. Come and make your voices heard on Sun., June 1, at 3 p.m. We’re gathering at the Short Stop, 1445 Sunset Blvd. in Echo Park. If you want, you can help us rally more forces by printing out the flyer at the top of this post and handing it out to people who might be interested. Mad as hell, not gonna take it anymore… You know the drill.